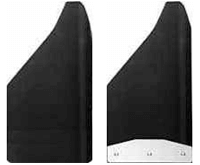 This Mud Flap for Ford Explorer is a Drill-less Mudflap, approximately 12 inches wide by 3/8 inch thick, designed to hang approximately 9 inches below the fender well. Application: FRONT of all 2011 thru 2016 stock Ford Explorers. Serviceability: This Mudflap is pre-drilled and requires no drilling of additional holes in your Explorer. Allows for easy & precise alignment, and drill-less installation.